I believe most of you have tasted roasted chestnuts. And probably some of you are even completely blown away by the aromatic wafts from sweet and moist, freshly peeled roasted chestnuts. But what about chestnut honey? Yes, I mean the unifloral honey that the bees made from the nectar of chestnut tree flowers. I read about this honey a couple pf years ago and remembered it possesses a unique aroma and tastes bitter, and that it was a honey not for the timid palate. Never knew the existence of bitter honey? Aren't all honeys sweet? I wasn't sure if Chestnut honey has any sweetness in it, but yes, this mysterious honey is reported to be bitter. Does that pique your curiosity just as it has done to mine? 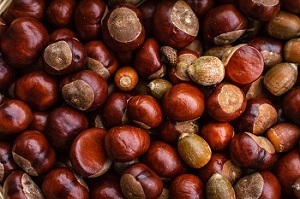 Chestnut honey is one of the most popular honey varieties in Italy, where a number of festivals are devoted to chestnut and a great variety of chestnut dishes are prepared for feasts and celebrations - salads, soups, rolls, pasta, pastries, desserts, cookies and of course, chestnut honey. The Italians also love combining chestnut honey with ricotta cheese and blue cheese. I opened the jar which is filled with amber-color liquid and took a whiff. Whoosh! There is an unmistakably, stunning dank, musty smell. I continued with a deeper sniff, Arrgg! Has it gone bad? It's a foul stink that reminded me of same pungent smell of some beech wood honey that I had described as smelly socks, and before I could get past that reek, the honey is already in my mouth and my taste buds cried out, bitter! The bitterness is too overpowering for me to detect any aroma of flowers. I could taste the mild sweetness, but the bitterness was too intense for me to analyse any other flavors. And even after you have swallowed it, the aftertaste lingered persistently in the mouth. The low Glycemic Index of chestnut honey explains why the honey wasn't as sweet as most honey. So it's a honey suitable for diabetics, like Tupelo and Acacia honey. The high fructose content of chestnut honey resists granulation and keeps it in liquid form for a long time. Interestingly, the bitterness in this honey disappears after heating, perhaps that's why it is popularly used as a sweetener for baking pastries and biscuit. Chestnut honey is one of the most studied floral varietals in research investigating the antimicrobial properties of honey. Many research studies have reported on chestnut honey's rich mineral content and exceptionally high levels of phenolic acids, powerful antioxidant and anti-bacterial properties. It contains a great number of mineral salts such as manganese, copper, iron, vitamins B and C. This honey turns out to be especially beneficial to the circulatory system and is recommended for cardiovascular diseases. It helps regulate liver functions, gastrointestinal tract and is effective in treating ulcers of the stomach and intestine. No doubt, chestnut honey is definitely an acquired taste. I still cannot figure out why the Italians love this honey so much. It will take a long time before I forget the nasty taste and have the courage to try it again. I was told that chestnut honey varies wildly in intensity of flavor due to the type of chestnut tree, climate, beekeeping methods and how the honey is refined after it has been harvested. So, I do hope the next time I pick up another jar of chestnut honey, it would be an entirely different experience! I wouldn't suggest newbies to try it, but if you like rich complex flavors and are drawn to powerful flavors that awaken the senses, it may be worth giving it a try. Besides, taste is be very subjective. 1. Why dark honey is good for you: Dark Honey Boasts High Antioxidants. End of "Seriously Italian: Chestnut Honey". Back to "Exploring Honey Varieties!"